I am away this weekend with my husband to visit our daughter at Jerusalem Farm, a Catholic intentional community located in Kansas City, MO where she lives and works. Jerusalem Farm is a not-for-profit organization which strives to transform the lives of the community members and those they serve “through service retreat experiences, sustainable living and home repair.” While there we will be participating in a weekend retreat entitled “Food and Faith.” In light of this experience this week’s blog post is taken from an essay I wrote in 2012 in response to my growing passion for sustainable agriculture and the Clean Food movement. Note that I wrote this essay well before the majority accepted the reality of Climate Change. I was raised in a family where the summer garden and its produce was on the table 12 months out of the year whether it was fresh, canned, or frozen. My parents had a serious vegetable garden, and still do as a matter of fact. Seed catalogs, visits to the nursery, and the smell and feel of soil were part of my upbringing. And because meat was expensive we ate relatively small portions of it—supplemented with lots of vegetables and fruit. As a child it did not occur to me that what I ate was particularly special; I’m sure I thought it was boring. Today, a clean diet like the one on which I was raised has become a privilege. Last week I stood near a woman at the grocery store who, like me, was trying to justify the cost of organic fruit. We talked about how it was the healthier choice not only for our bodies but also for the earth. But she was buying for a family; I was only shopping for my husband and myself. It is an injustice that consumers have to lower their standards of what is good and healthy in order to feed their families. Food is morally significant. What we buy helps heal or worsen the wounds caused to the earth, to animals, to the laborers, and to our bodies. Several years ago my youngest daughter recommended a lecture given by one of her college professors on the effects of climate change. The lecture, given by Creighton University theology professor, Richard Miller, Ph.D., was based on his award-winning book, “God, Creation, and Climate Change: A Catholic Response to the Environmental Crisis.” The talk focused on the overwhelming scientific evidence of climate change emerging from the NOAA (National Oceanic and Atmospheric Administration), the EPA, various University studies, and other substantiated global sources. The evidence made me feel angry and helpless about our culture’s blindness and resistance to accepting the truth. I began to consider the impact unchecked climate change would have on our agricultural system and global food supply and I realized I had to get educated. I began to read up on soil science, sustainable agriculture, and biodynamic farming practices. My husband and I watched many documentaries including Ana Sophia Joanes’ underground movie, “Fresh,” and saw both the diseased belly of corporate farming and the success of its antidote. My eldest daughter, at the time an undergrad at the University of Iowa, was taking a course on the food industry and shared some of her sources with me. I found out how livestock and poultry farms had been converted to animal factories designed to keep pace with our growing demand for cheap meat, using methods both inhumane and harmful to the animals, to us, and to the planet. I learned about corporate agri-farms which have perfected the science of producing high yield mono-crops of genetically modified corn and soy with the prophylactic application of synthetic fertilizers and pesticides and herbicides. I also learned enough to conclude that what “Big Ag” corporations are really up to as they participate in the mad science of genetic modification is to literally handcuff farmers to an interdependent system of patented seeds which require their own patented herbicides. For example, herbicides such as Roundup™ are so effective at selectively preventing seed germination that only patented “Roundup™ ready” crops, also known as genetically engineered crops (GEs or GMOs), which produce their own pesticides can survive. I’m not the only one who might suggest that the purpose of GMO Roundup™ ready crops is to sell more Roundup™. And, by the way, the produce of these genetically modified seeds has been on our plates either in vegetable form, in processed foods, or as part of the diet of the meat and poultry we eat since 1994–without prior safety testing. And we wonder why so many of us have developed digestive problems in that time period? No doubt, improving farm practices to increase crop yields in order to eliminate world hunger is a good thing. However, what I discovered is that no matter what corporate spokespeople claim, eradicating world hunger is not the driver of Big Ag companies and the corporate farms they run: corn and soy are grown primarily for livestock feed. I learned that in lieu of tried and true soil sustaining practices such as crop rotation and allowing fields to lie fallow for a season, corporate farmers force feed their crops synthetic fertilizers which destroy organisms necessary to life-sustaining soil, thus killing the soil’s ability to nurture growth without the application of higher doses of fertilizer. Further, it is estimated that only 1/3 to 1/2 of synthetic fertilizers are absorbed by the plants, the remainder is washed away by rain which flows into and pollutes our water systems. Each atrocity leads to another, corporate farm monopolies, seed contamination, soil erosion, super weeds, unwitting consumption of second-hand hormones and antibiotics, farm worker injustices, and pollution that knows no bounds. The current factory farm model of agriculture is unsustainable and yes, sinful. It poisons the earth and it poisons us. It abuses creation and shrugs off our responsibility to be good stewards of it. This is why I am an advocate and student of the Clean Food movement. I feel called to support a more authentic relationship not only with my body, but with the earth and with the people who draw from the soil gifts of food using methods that enrich, rather than deplete it. I am affirmed daily by the greater variety of sustainable and organic foods are available to the consumer, increased education and awareness campaigns, and opportunities for conscientious investors to help fund small farms, canneries, and retailers. My choice to purchase food from sources that use methods respectful to the earth began with a desire for greater personal health, but has become something greater. My action is driven by the desire to support the purpose and dignity of the land, the animals, the farmers, the workers and everyone involved from farm to fork, especially those who eat the food. And that is the problem. 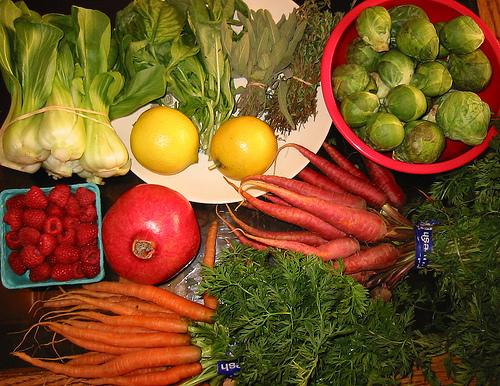 Clean food is generally limited to those who can afford to buy it or who grow it themselves. Affordable, clean food is a human right, not a privilege. The fact that it is cost prohibitive for most consumers leads to an unsustainable food industry. The availability of clean food for everyone, not just those who can afford it, is undoubtedly a moral issue. It is clear to see why it matters. But even on a small-scale reform of the current corporate food system and its far-reaching tributaries in the United States alone is a herculean task for activists, lobbyists, educators, scientists and the medical community. But change is happening, and the desire for clean food justice will continue to be the sharp pebble in the shoe of the deniers until clean food is affordable and available to all human beings.